"Hi Jeff & Laura - I visited your family's farm and would love to try your pork - but it's so much more expensive than Farm X's pork. Why is yours so much more expensive?" This is not an uncommon question from new customers and it is one we are very comfortable answering. We know our meat is more expensive than other local farm's food and the primary reason comes down to our choice to feed organic. This one decision has a dramatic impact on the cost of raising our food BUT an even bigger impact on the environment, the animals, and ultimately (we believe) our health. You are what you eat, or in the case of our pasture raised foods -- you are what your food eats. Farms are popping up all over the place shouting from the rooftops that they are feeding their animals Non-GMO feed. Since GMO's are bad, this must be good right? Some are even claiming this is similar to organic. However, they could not be further from the truth. Organic food and Non-GMO food have far more differences than similarities. Farms who are feeding non-GMO feed that is NOT organic are feeding some of the most pesticide laden, heavily sprayed food being grown. There are a lot of misconceptions with the terms Non-GMO and Organic. When we started our farm several years ago we chose to feed organic feed at Synergistic Acres. This decision comes after much thought and research. THERE IS ALMOST NOTHING SIMILAR BETWEEN ORGANIC AND NON-GMO FEED except that one uses non-GMO seed for the initial planting. As the chart above shows, Non-GMO and Conventional use synthetic and chemical pesticides, herbicides and fertilizers on their crops. Organic uses NONE. That is a big difference. We know that our farm is small and only a mere speck of the nation's crop production goes towards feeding our animals. However, we also believe strongly that each and every part counts and we DO NOT want to contribute to an agricultural community that is part of using pesticides and herbicides at an ever-growing rate. We want to be part of the system that reverses that trend and instead compels fellow farmers to grow food that is not doused with synthetic herbicides and pesticides. It is my fear that many Kansas City eaters are shopping for local, naturally raised meat that is healthy and nutritious. They are visiting websites and they see a farmer with a slick website showing they feed Non-GMO feed and eaters innocently believe they are buying the cleanest, least contaminated food possible. Research even verifies this fear. A recent survey of consumers showed the majority believed Non-Gmo labeled foods were held to a higher standard than organic foods. This is completely false, but perception trumps truth in consumers buying decisions. When two products are compared side by side -- Non-Gmo will always be cheaper than organic, because it is much cheaper to grow the grain using pesticides and herbicides rather than organically. This confusion is compounded for local organization KC Food Circle that works to connect eaters with local organic and free range farmers. KC Food Circle requires its vegetable farmers to follow organic standards, but does not require its animal producers to use organic feed. They are moving towards requiring Non-GMO feed. However, I worry this will confuse eaters leading them to once again think non-GMO and organic are similar terms. I am not a fan of there being any rules suggesting farmers can or cannot label their foods a certain way. Instead, I consider my job to educate the few people that have come to trust our farm as to why we choose the food we choose. A local organic feed free of any pesticides, herbicides or synthetic fertilizers. I also want our customers and those that are just learning about our farm to understand that the reason our costs are higher than farms that might have similar standards but do NOT feed organic, is because there NON-GMO feed is MUCH cheaper than organic feed. In most cases NON-GMO feed is less than 1/2 the cost of high quality organic feed, like our animals get. This makes a HUGE difference in the cost of raising the animals. If you are looking at buying meat somewhere else, ask the farmer a few questions. If they are labeling their animals as being fed Non-GMO, are they also feeding organic or are they feeding grain that has been grown using lots of synthetic fertilizers, pesticides and herbicides. Once you have this information, you will have what you need for deciding what the best food for your family is. P.S. Another misunderstood term is AMISH GROWN FEED. This does not mean organic either. In fact, most Amish growers whether of vegetables, grains or animals, use as much if not more chemicals as any conventional grower. Amish does NOT equal Organic. It's like having a meat counter at your house everyday! We will be having a set of our very special organic fed and Pasture Raised Heritage hogs going to the Butcher this month. This will be our last group for several months. If you want to buy our pork in the most CONVENIENT and VALUED way, this is your chance! Another key perk is cut CHOICE. You want thick or thin bacon? Do you like your sausage hot or mild? How many chops per package are convenient for you? What about the thickness of your chops? It's your choice! Jeff will call you and easily walk through the steps to ensure you get exactly what you need for a multitude of meals at your fingertips. The cost is $6/# hanging weight and the typical 1/2 a hog weighs 70-90 pounds. All processing fees are included in the price. This will be the final group of pigs going to market this season. If you don't buy a 1/2 now -- you won't have another chance for many months. We must have our orders by February 2nd. Simply send us an email letting us know you are interested. We will get back with you and find out how you want it cut, how to send in the deposit and arrange for delivery. We have had several people say they really wanted a chance to learn how to raise and process their own chickens and were hopeful we would have another class this Fall. We had not originally intended to do a fall class, but have decided that we can can do one to meet people's desires. Our scheduling is very tight since this is the time we butcher our farm's fall chickens AND our Thanksgiving turkeys! We MUST know by this Friday the 23rd in order to reserve chickens from our last customer processing this weekend. Former attendees commented this class helped them feel comfortable with the idea of raising their own chickens and seeing the butchering process up close and personal. Attendees ranged from curious eaters to serious potential farmers. All left with positive comments and new ideas! Chickens are an iconic part of the family farmstead and have even evolved to be a popular and valuable part of suburban, urban and rural areas of Kansas City. Chickens have gained this status because they are immensely useful and important. In this workshop, we will cover all the basics of raising chickens from brooding new chicks all the way to butchering and preparing them for meat. All topics will be taught hands-on with examples of what has worked on our farm along with plentiful anecdotes of things that haven't turned out so well. We will have birds in all stages of development, so you will get to see exactly what it could look like on your farm. We will give clear examples of how this can be managed at a working-farm scale like ours all the way down to the homestead minded person just keeping a flock for their family. The class will be divided into two sessions. The morning session will be a hands-on chicken butchering workshop. Each person will have to the opportunity to learn each step of butchering a chicken and then be able to butcher their own chicken to take home after class. You will get to see how to butcher using modern commercial equipment such as automatic scalders, dunkers and pluckers as well as how to do it with minimal equipment that you would have at your own home. The afternoon session will include a hands-on tour of each step of the chicken raising journey as well as a guided tour of the farm seeing the brooder, the pasture pens, the egg mobile, electric netting, etc. We will also look at how turkeys fit into our farm's poultry operation. There will be a short "classroom" setting where we talk about the finances involved with raising poultry, marketing ideas, and the laws surrounding poultry in Kansas. In-between the sessions there will be a full lunch with pasture raised meat from our farm where we will be able to sit down and talk farming with other lunatic farmers. You may choose to attend either of the sessions individually or you may attend both sessions for the whole picture on pasture raised Poultry. If attending both sessions, the cost is $100, a savings of $25! When finished, you will have the skills needed to butcher your own chicken in a humane and respectful way. In addition to learning the steps, you will complete the entire butchering process on an organic fed Pasture Raised chicken that you will be able to take home to share with your family ($25 value). Lunch will be served farm style with pasture raised meat from our farm. It will be a time to visit, get to know each other, share ideas and ask questions. This portion of the class will be focused on learning how to raise healthy and productive chickens. We will start by learning all of the details for brooding your birds from newly hatched chicks. Then, we'll discuss the important factors for transitioning your birds to pasture and what differences exist if you are raising them for meat or eggs. You will get to see up close the different shelters we use for each and we will discuss construction details including what has worked and what has not worked in our farm experience. We will discuss how chickens fit within the overall structure of our farm's systems by cleaning up parasites behind the cattle and by intensively fertilizing targeted pasture areas. We will wrap-up with a classroom session where we will discuss marketing your products and local laws affecting the selling of your products. This workshop will be outside so dress accordingly. Although you may be surprised at how clean you stay during the chicken butchering portion of the workshop, you may want to dress in layers so you can peel your top layer off when that portion of the workshop is done. Waterproof footwear is suggested for all participants. To register for this class, please click here and fill out the form. The form will include directions for payment. There are very limited spots available, so register early to ensure availability. You follow Synergistic Acres because you care about food quality. You purchase our meat because you know it is naturally-raised, fed organically and raised without antibiotics. You have seen that we are a pasture based farm and know this type of food is healthy for you and your family. You buy your pork, chicken, beef, turkey and eggs in confidence that it was made from a happy animal—a robust ruminant that had the pleasure of living its life on verdant pastures, happily chewing its cud or an energetic pig that used its sturdy snout to plow up soft earth or even a chicken that enjoyed dust baths and chasing after grasshoppers and eating grass (yes, chickens eat grass!). BUT, how do you KNOW that is really how we raise our animals? Are you confident that you can trust what we say on the blog or facebook? Are the pictures we share online really from our farm? Have you personally visited the farm to see for yourself? Farmers (and advertisers) are keen on what consumers want, which is why most farm products are graced with images of green pastures and happy animals. However, it is up to you to ensure the pretty pictures mesh with reality. We believe there are all types of consumers and all types of farmers. Some consumers want Heritage meat and some farmers want to focus solely on growing Heritage animals. Some consumers want cheap meat and some farmers want to produce meat cheaply. Some consumers want organic everything and some farmers are certified to produce that way. And there are some consumers who value naturally raised products and farmers that enjoy producing food in such a manner. Any of these situations, and many more, are valid partnerships. It is the dissonance of a consumer wanting naturally raised meat that is swayed by a picture of a chicken on a lush pasture, when the farmer is really raising the chicken in a large indoor barn. Or the consumer that wants grass fed beef and finds a farmer that purports their beef is grass fed but fails to mention that grain is also provided. Small detail. What about the consumer that believes 'organic' means raised in the sunshine and fresh air? How do you know what animals are grown? How they are grown? Where they spend their days? What types of food they have access to? How they are treated? We believe if you see it with your own eyes, you can answer those questions! Please join us in continuing the conversations about the ways in which we grow and produce food in the Kansas City area. Spring Tours are Sundays, May 17 and June 7. The hay ride leaves the gate at 4pm and the tour lasts about 90 minutes. We will take you to see each of our animals and explain how we raise them on our farm. We answer any questions and enjoy conversations about pasture raised food! Let us know you are attending and we'll save you a hay bale! Lard has been demonized in modern day kitchen circles because it has become synonymous with fat which was equated with the opposite of healthy. Nothing could be further from the truth. Lard, when made from the fat of a pasture raised pig, is very nutritious. It has all kinds of good fats in it and very little bad fats. As a matter of fact, it's natural balance of essential fatty acids make it one of the healthiest fats with which you can cook. It is 48% monounsaturated fat (the good stuff that makes olive oil a healthy oil), the high oleic acid content is a heart healthy essential fatty acid that reduces cholesterol, and it has a good balance of Omega-3's - especially when it comes from a pasture raised pig like our Large Blacks. So why did lard get a bad name in America? Well, that mostly was a result of marketing from industrial food companies like Crisco, touting their "healthy" alternatives. It took us a few decades to figure out those the claims of manufactured and highly processed vegetable fats are nowhere near as healthy for the body or as tasty for the mouth as the old-fashioned lard. After all, waist-lines have not exactly shrunk in the last 40 years. Instead, we know most of these vegetable oils were developed to use waste products the parts of plants that could not be used otherwise. Generally, this is a great idea. However, when the resulting product takes vast amounts of new technology to make them palatable - such as hydrogenation - then the results aren't always better and many cases very harmful to our health. Another reason lard lost favor in America's kitchen is because once pigs became intensively raised in industrial settings and their feed became more and more complex, the quality of the fat became less desirable. Fat is one of the biggest ways the body removes toxins from the body. The fat of an animal tends to have all of the positives and negatives of its diet condensed and intensified within. Modern day store-bought lard has been highy processed, hydrogenated and preserved. It has the unwanted trans-fatty acids and very little of the condensed goodness that lard from a pasture raised pig has. It's no wonder cooks were looking for something different. Now there is an alternative though -- lard from Pasture Raised Pigs, like we have at Synergisitic Acres, brings back the wholesome, nutritious food we used to know as lard. This was the lard your Grandma loved. This is the lard that had far more health benefits than modern-day shortenings. This the is lard you can feel good about eating. Lard comes from the fat of a pig. There are two types of fat that can be used to make lard. One is back fat, the more abundant of the fats on a pig. It is the fat that lies just beneath the skin insulating the flesh from the outside. The second type is leaf fat. This is the fat that surrounds the internal organs of the pig. Leaf lard is the most pure of the fat and should be used when you want the absolute purest lard to use in delicate cooking like with pastries. Before you can use the fat as lard, it must be rendered. Rendered is a fancy term for a rather simple process of heating and straining the liquid fat before cooling it and storing it. As a demonstration, I rendered some of our very special lard in our kitchen and documented the process. I started with two pounds of frozen back fat. We put this back fat into the crockpot on low with about 1/4 cup of water and put the lid on. After about 45 minutes, the fat was soft enough that I could take it out and cut into chunks and put it back into the crockpot to begin rendering. This is the point where I made my first mistake of the process that I would not realize until later. After cooking the lard for about 2 hours, very little had rendered down, what was I doing wrong? I started by turning up the heat on our crockpot to high and continued to let it cook. More fat rendered down, but still not at a rate recipes seemed to indicate -- so I tried the next thing I could think of -- I cut the chunks into even smaller pieces and this worked like magic. Very shortly, the potion began to boil and bubble and rendering was now in full force. After about one more hour of this, I skimmed off the first quart of lard. When first removed, it looks rich and golden like fresh broth. After cooling outside for just about 1 hour (granted it was 15 with a 20mph wind) it turns a beautiful pure, snow white color. It is now ready to go into the fridge where it will keep for months. The 1.91 pounds of backfat when rendered created 1.5 pints of beautiful, nutritious lard. We sell backfat and leaf lard from our pasture raised pigs. 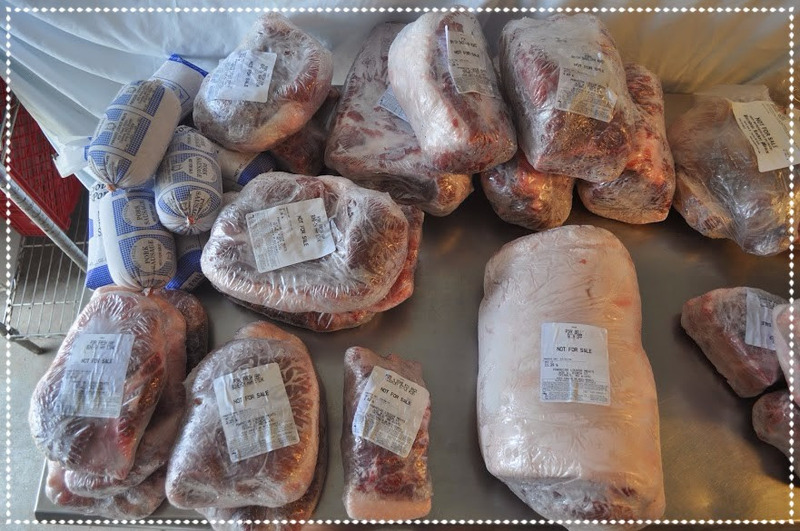 If you would like to buy this or many other pork products such as bacon, sausage, hams, bratwursts, and pork chops, take a look at our pork ordering page. We can bring it to you on our next delivery to Lenexa on Wednesday evenings or you can pick up on farm by appointment. We are excited to hear how you use lard in your home!